October 14, 2018 I was recently reflecting on a strange experience I had when leading Uber's SRE team, which was being asked by an senior engineer on the mobile development team to prioritize setting up and managing their mobile test clusters. At the time, most of my attention was focused on how we could clarify better interfaces around the services we provided, eventually ending with a service cookbook, but as I reflect on it now, what comes to mind is something else entirely: how frequently teams and organizations make resourcing decisions that at least initially come across as entirely implausible. October 13, 2018 One of my personal goals for the year has been to write more, and this is the sixty-fifth post I've written this year. A quick update on traffic, writing goals and such. October 1, 2018 Although it's not universally true, I've found that as folks move into more senior roles, they spend a lot more time writing. The nature of these documents vary depending on your role--strategies, presentations, memos, announcements, email, etc--but your written word often becomes your most important medium of communication. I'm fortunate to have spent a lot of time writing over the past decade, in addition to attending a liberal arts college, so this shift has generally has been something I've enjoyed. 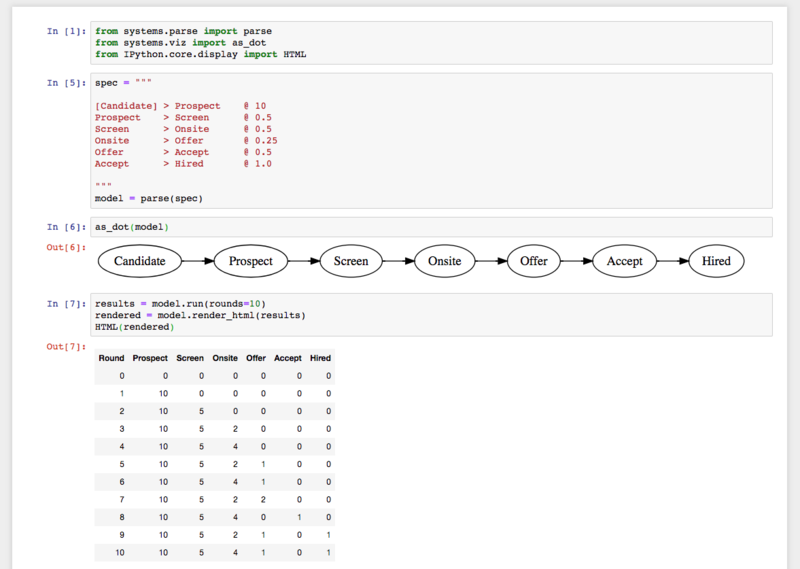 System dynamics in a jupyter notebook. September 30, 2018 A few weeks ago I published the first version of the systems library for modeling systems dynamics. Today I cut a second version with improved support for itereating on models in Jupyter notebooks. September 26, 2018 A peculiar challenge of management is trying to invest in someone's career development when they themselves are uncertain about their goals. As a manager, you may have more experience and more access to opportunities within the company, but that represents a small slice of their career possibilities. Our schooling often rewards us for being methodical, linear thinkers, but that approach is less effective outside the intentionally constrained possibility spaces.